For some reason the woodland ride that connects the Chelsea Flower Show’s Artisan Gardens seemed particularly quiet this year. On previous visits this pleasantly shaded route has been thronged with visitors, to the extent that the grass bank opposite has needed to be reinforced to protect it from wear and tear. This year there were fewer, albeit larger gardens and at least one vacant plot, which was a disappointment given how popular these smaller gardens are with the public. I can only imagine the cost of staging even a small garden must have risen beyond the means of the charities and regional organisations that are typically exhibit here. Having put plans for a holiday somewhere hot and steamy on the back burner whilst we complete building projects at home, I was delighted to immerse myself (not literally) in Sarah Eberle’s floating tropical paradise created for Viking River Cruises. Inspired by a trip along the mighty Mekong river, through Cambodia and Vietnam, Sarah was inspired by floating gardens fashioned from dense mats of floating vegetation. Here local farmers cultivate fruit, vegetables and flowers for cutting. 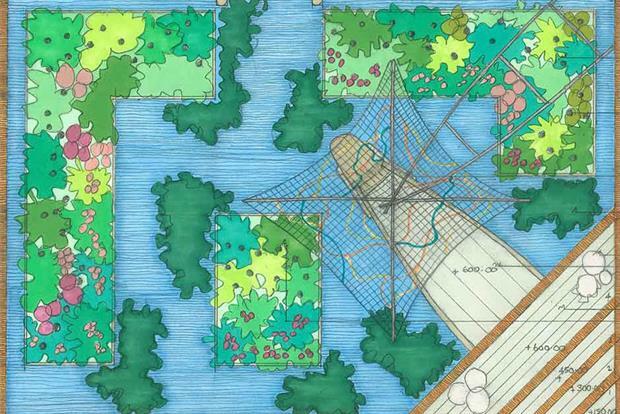 In an unusual twist for Chelsea, Sarah’s garden was bounded on every side by water; a triangular deck at one corner giving access to the deck of a traditional boat arranged for lounging rather than fishing. 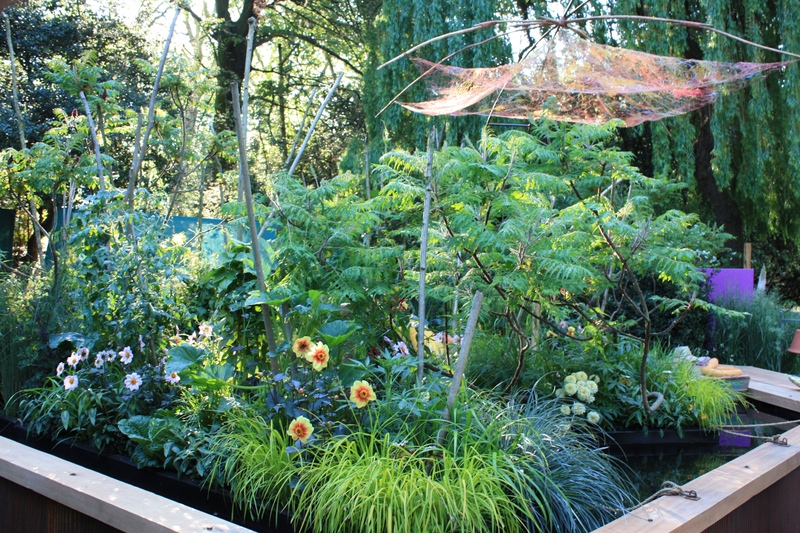 I was fortunate to experience the garden very early on the first day of the show, shortly after the designer had been awarded an RHS gold medal and the coveted title of Best Artisan Garden. 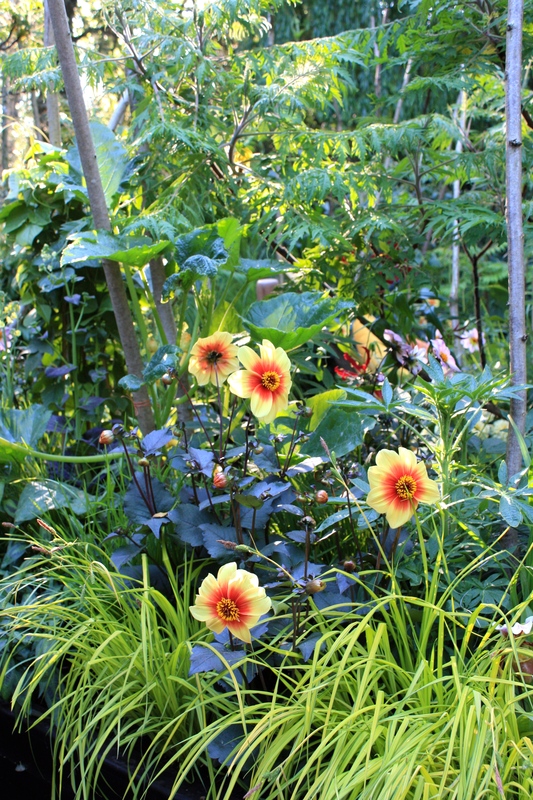 As sunlight wove its way through tall plane trees, the garden was bathed in a soft, golden light. I could have been back in Burma, at dawn, on Inle Lake, a location synonymous with its floating gardens. 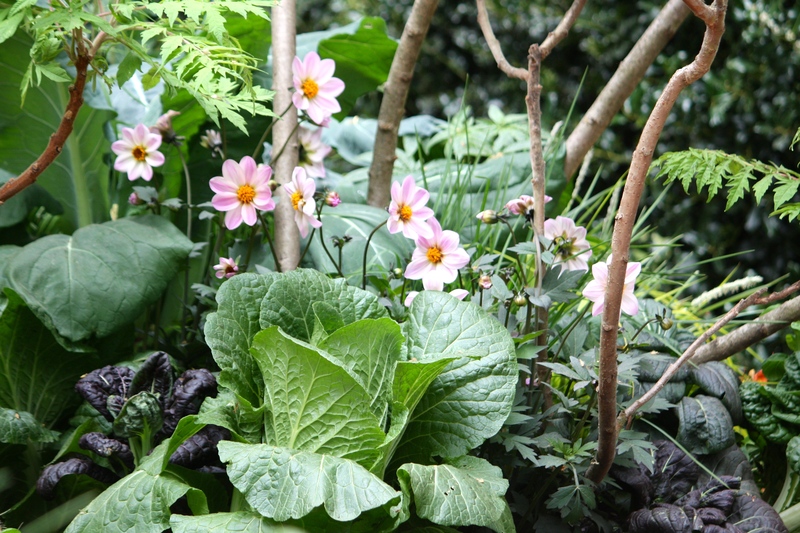 Spinach, kale, aubergine, gourds and okra vied with dahlias and orchids beneath an understorey of stag’s horn sumach (Rhus typhina “Dissecta”). This was a brilliant piece of planting design. Not every plant used was genuinely tropical or necessarily found in South East Asia, but the effect was still extremely convincing. Sarah’s gloriosa lilies, dahlias, cleomes and zinnias would be happier along the banks of the Medway than the Mekong, but the paphiopedilum and masdevallia orchids would need protection in the UK. Created by artist Fiona Campbell, a diaphanous parasol was poised above the boat’s cushion-strewn deck. The design was inspired by the shades used by fishermen to protect themselves from the sun and was woven to emulate the fishing nets hung out to dry along the Mekong’s banks. Copper wire and electrical cables used to construct the parasol represented the countries’ silk and cotton-weaving industries. 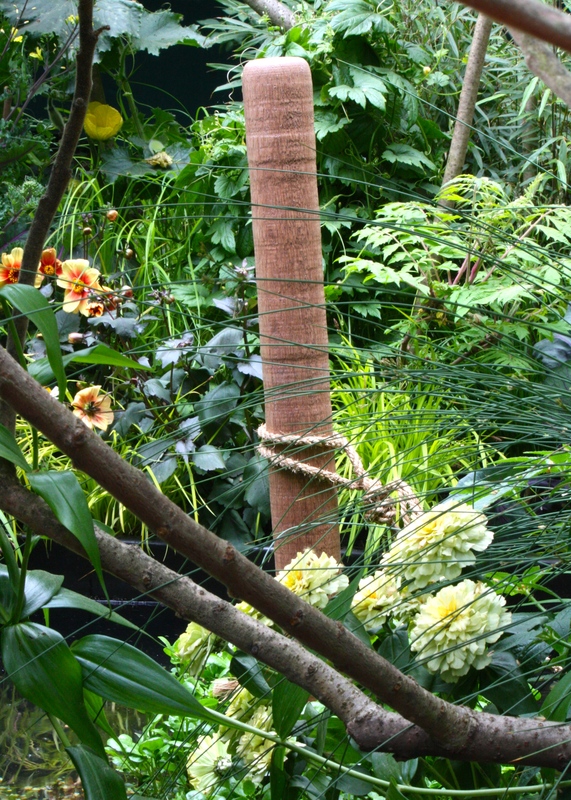 I loved this garden for its originality and inventiveness. Just for a moment I could imagine myself reclining on that boat, Panama hat tilted over my brow, staring up a clear blue sky as I glided down the sultry Mekong. It made me want to reach for my travel brochures: the reaction, I suppose, the sponsors were hoping for. O I wish to just jump over the North Sea and visit this event. Did you buy anything for your garden ? It’s not a great shopping experience unless you are looking for furniture, sculpture or hardware. Plants are not allowed to be sold (thankfully) but I did purchase some lily bulbs, seeds and specialist plant food for Nerines and Agapanthus. You should come and visit Chelsea one year! 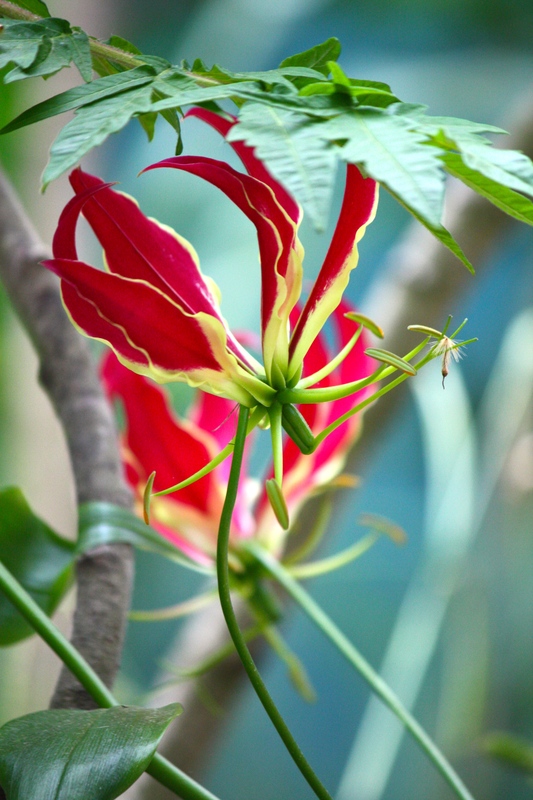 Dear FG, Gloriosa Lily looks like G. rothschildiana to me. I have acres of G. superba . It is a declared weed here in coastal S.E. Qld . 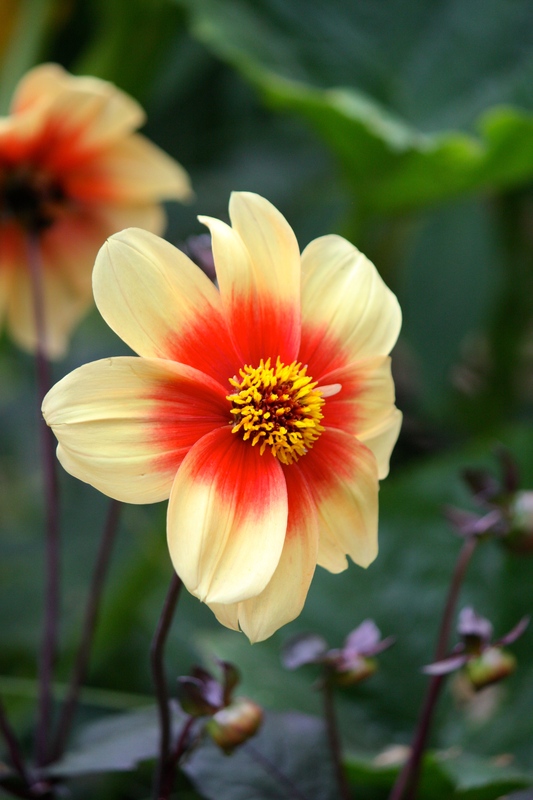 Very nice orange and yellow flowers but spreads madly by tuber and seeds. I have the maroon and yellow one pictured -in my garden and have known it as G. rothschildiana. I agree with you Lorraine and had tagged it as such in the picture originally. But the garden’s literature flags it as G. superba so I questioned my own judgement. Since the two of us are agreed I am going to change it back. I should know to trust my instinct!! Lucky you having it as a weed though. Its unimaginable to think of gloriosas being anything other than terribly exotic and desirable here. I have three different species, including G. rothschildiana, growing in my greenhouse right now. I wonder why Ranelagh gardens were so quiet this year? The photos as always Dan are superb and I don’t mind what type of Gloriosa it is I love the added London Plane tree seed!!! It was a pity. There was one garden that was very classical and didn’t stand out, then only four others if I am counting correctly. One, of course, belonged to the fabulous Kazuyuki Ishihara. The added plane seed was an added bonus. The rest could be found up my nose, in my hair and stuck on my lapel! That’s a shame there were so few…probably costs or now fewer colleges running design courses as they used to feature along there. When I was at college we had one about 10 years ago heavily sponsored of course! Yes the Chelsea dandruff always a good look on the lapels and hair!! Hope you have stopped sneezing? Happily it doesn’t really seem to affect me! Phew. Yes, you are right, colleges, tourism organisations and charities were missing. Charities I expect are having to be much more circumspect about these things nowadays. A ha! I knew I could count on you Dan! 🙂 Around Clapham there are loads of plants that look very similar to the trees featured in this garden, so I came here to find your plant list to identify the name. I suspect they are a Rhus typhina but typical pinnate, not the “Dissecta” cultivar. They seem to seed around, so I have taken a little cutting I’m hoping to root. I love the look of them in my local area anyway, but saw a whole new side of them in this show garden. Thanks! No problem. Rhus is a lovely plant but it can sucker quite aggressively. The leaf colour in autumn is spectacular. Hope your cutting roots Jack, but if it doesn’t, find a nice sucker you can pull up!